The open roads of southern Europe are calling! By now you know that Forza Horizon 2 is coming to both Xbox One and to Xbox 360. Today, we’re going to take you through the highlights of the Xbox 360 version of the game, which is being developed by Sumo Digital, to give you a taste of what to expect from the next great Forza game. In addition, we’ll also point out some of the important differences between the Xbox 360 and Xbox One versions of Forza Horizon 2. Let’s dig in! 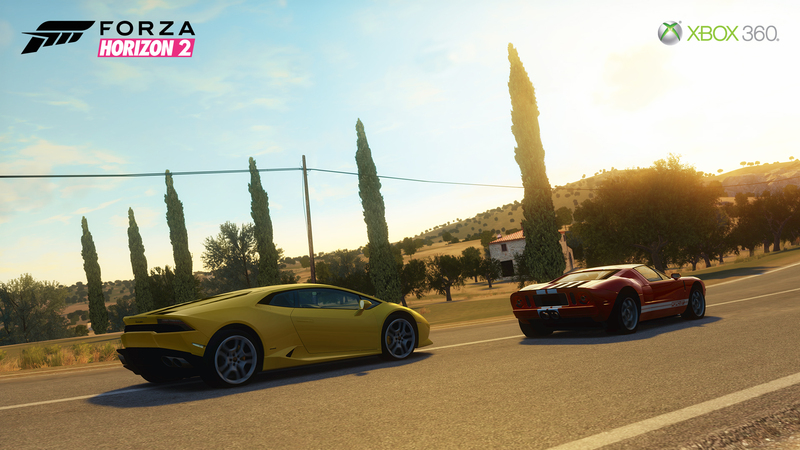 Forza Horizon 2 for Xbox 360 will take you on an epic road trip through the beautiful open roads of southern Europe. Forza fans will be able to travel the wide open roads to cities and towns like Nice, Sisteron, and more, exploring a massive world that is even bigger than the original Forza Horizon on Xbox 360. You can go where you want in this world – driving across fields and finding your own path to victory. In fact, in terms of drivable play space, Forza Horizon 2 on Xbox 360 is more than twice as big as the original Forza Horizon, giving you the freedom to go where you want, when you want. And of course, you will be able to explore this amazing world with a full 24-hour day/night cycle, and all running at native 720p and a locked 30 frames per second, just as in the original Forza Horizon. That freedom extends to the car list in Forza Horizon 2 as well. The game will ship with more than 200 cars – nearly twice the cars that were in the original Forza Horizon. The roster of cars is once again an eclectic lineup, where supercars can go toe-to-toe with rally legends, American muscle cars, and more. In addition, the Xbox 360 version will include ten amazing barn find cars that players will encounter during their automotive journey in Forza Horizon 2. In Forza Horizon 2, you will be traveling from one picturesque city to the next, taking on nearly 500 events in total, all tailored to the cars they are in – nearly four times the amount of events that were in the original Forza Horizon. As you compete, you will in the ranks of the ultimate music and cars party, the Horizon Festival. While you will be able to enjoy Forza Horizon 2 solo against computer-controlled AI opponents but the game truly comes alive online. Up to eight people can play online over Xbox Live in Online Free Roam and Online Road Trip modes, including a variety of multiplayer racing, cooperative challenges, and Playground modes like King and Infected. Players can also band together and form car clubs of up to 100 members. The game will also feature asynchronous challenges like Rivals mode and Speed Camera events. As always in Forza games, Forza Horizon 2 for Xbox 360 will feature car customization, including car upgrades and the livery editor tools. While both the Xbox One and Xbox 360 versions of Forza Horizon 2 will feature full day/night cycles, only the Xbox One version will feature weather effects. By accurately simulating the atmosphere and the particles within it, the developers at Playground Games have created amazingly realistic weather effects – including rain, drizzle, and fog. These weather effects, complete with realistic spray effects and gorgeous puddle reflections, add near limitless visual variety to the world of Horizon 2. In addition, driving in the rain offers a new level of challenge for experienced Forza drivers. 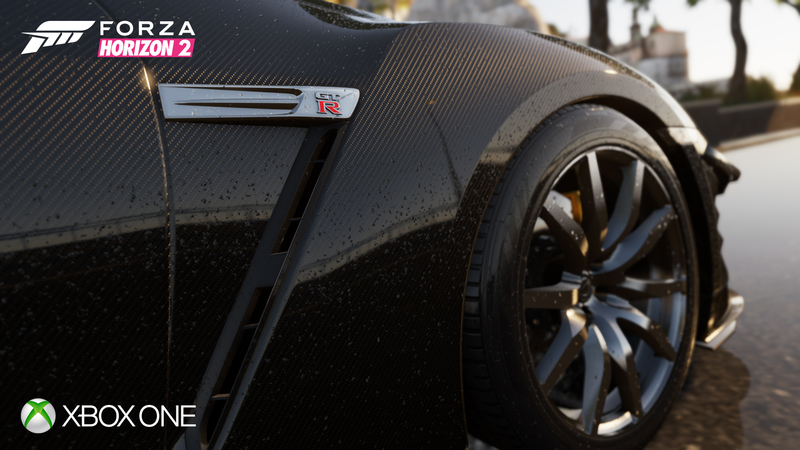 All of the cars in Forza Horizon 2 for Xbox One have been built from the ground up to take advantage of the Xbox One. That includes features like state-of-the-art materials modeling and the advanced suspension articulation system that was featured in Forza Motorsport 5 and only available on Xbox One. Because of this, certain cars will only appear in the Xbox One version of Horizon 2. While the exact car lineups won’t be the same, both the Xbox 360 and the Xbox One versions of Forza Horizon 2 will feature more than 200 cars available at launch. With Forza Motorsport 5, Drivatars revolutionized circuit racing game opponents. Now, in Forza Horizon 2, the Drivatar feature is set to do the same thing in the open world playground of southern Europe. In Horizon 2, you’ll encounter the Drivatars of your friends and families throughout the world, whether you’re cruising around Nice or blasting across back-country roads, trading paint in a championship race. In Horizon 2, Drivatars don’t just learn how you drive, they learn where you like to go. You can follow a friends’ Drivatar around the world to discover new areas of the map, or find new unlockables and secrets. Your Drivatar is always racing, even when you aren’t playing Forza Horizon 2, and you’ll be able to collect the rewards from your Drivatar’s races the next time you log into the game. Once again, Drivatars are set to change the way racing fans think of “A.I.” opponents, and it’s all powered by Xbox Live on Xbox One. While playing with Drivatars is a great way to enjoy Forza Horizon 2 solo, sooner or later you’ll want to take things online and prove yourself. With Forza Horizon 2 for Xbox One, we’ve made getting online is easy as pressing a button. No lobbies, no waiting; you’re online and racing with up to 11 other friends in Online Free Roam mode, Online Road Trips, or private matches. You can also take part in Car Meets throughout the world, where you can meet up with fellow car fans to check out paints and tunes, talk cars, or set up race matches. Finally, Car Clubs on the Xbox One version of Horizon 2 can contain up to 1,000 members, all of whom can help move their Club up the global Club leaderboards. Look for Forza Horizon 2, coming to Xbox 360 and Xbox One, beginning on September 30.